Within an international context increasingly focused on “green” choices, the housing market is paying attention to solutions designed to minimize the use of energy for the maintenance of the conditions of thermo-hygrometric comfort inside the building. In the world there are many evaluation systems and sustainability certification, the most important are based on “scores”, which give a value to each of the claims relating to certain characteristics such as, for example, the management of water, the use of renewable resources and energy, prevention of pollution, control of indoor air quality, etc.. It is appropriate to review briefly the best-known systems. 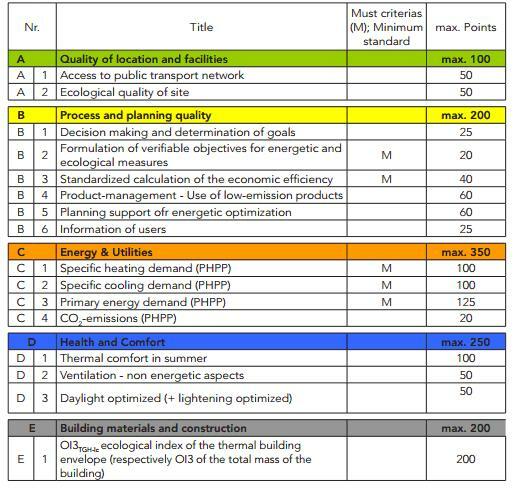 Among the first instruments for the assessment the sustainability of buildings is the BREEAM (Building Research Establishment Environmental Assessment Method). The UK system was developed in 1990 by the BRE (Building Research Establishment) and represented a reference point for the elaboration of the methods later. Since 1990, the debut year of of BREEAM with the first version on buildings for the tertiary sector, the BRE has adapted the scheme of the method to a range of building types: offices, new construction and existing offices, supermarkets, industrial units and new homes. The application of the method is voluntary and after a certificate is issued which certifies the performance of the building. The certification system certainly more widespread globally, however, is the model LEED (Leadership in Energy and Environmental Design), defined and promoted by the U.S. Green Building Council (USGBC) in 1993, this in more than 110 countries. LEED certification is a voluntary standard adopted from the market and is an essential tool to achieve a transformation of the market. LEED is a flexible and articulated system which provides formulations differentiated for new buildings (Building Design & Construction – Schools – Core & Shell), existing buildings (EBOM, Existing Buildings), small houses (LEED for homes), while maintaining a basic approach consistent between the various areas. The system is based on credits for each of the requirements that characterize the sustainability of the building. Summing up the credits earned in each of the six categories, you get a specific level of certification, which attests to the performance achieved by the building in terms of environmental sustainability. • PLATINUM (80 or more points). Three are the most significant environmental labels in the Italian Alpine regions: Protocollo ITACA, LEED Italia and Casaclima Nature. Protocollo ITACA is promoted by the Italian Regions and it has a public origin. The assessment system is managed by ITACA (Federal Association of the Italian Regions) with the scientific support of iiSBE Italia and ITC-CNR. Protocollo ITACA is based on the international assessment methodology SBMethod of iiSBE and it has been contextualized at local level by several regions: Piemonte, Liguria, Valle d’Aosta, Veneto, Friuli Venezia Giulia, Lazio, Marche, Toscana, Umbria, Puglia and Basilicata. At regional level the Protocollo ITACA is mostly used to support specific policies to promote sustainable building. In particular in the framework of the social housing programs, where economic incentives are given on the base of the environmental performance achieved. Beside the regional versions, in 2011 a national version of Protocollo ITACA is been delivered and a national certification process was implemented also. This national certification is intended to create a point of reference for the market stakeholders. The certification system is voluntary, apart from the region Friuli Venezia Giulia that has made it mandatory for some interventions and destinations of use of buildings. LEED Italia, launched in 2010, is managed and promoted by GBC Italia (Green Building Council) and it is the Italian adaptation of the U.S. LEED. The origin of the system is mainly from the private/industrial sector. LEED Italia is supported and recognized by the Province of Trento. The certification LEED Italia is voluntary. The system is articulated in different versions for new buildings, existing buildings, small houses and neighborhoods. The Province of Trento adopted LEED in incentive based polices for green building. LEED Italia is the unique European adaptation of the US LEED. GBC Italia is a no profit association open to all the stakeholders of the building sector and it is part of the World Green Building Council. Casaclima Nature is an „expansion” of the Casaclima energy standard. The certification is managed by the Agenzia Casaclima, a public organization located in Bolzano. The Casaclima certification has been the first in Italy introducing the energy rating for buildings and it is mandatory in the Province of Bolzano, while outside the province it is voluntary. The first national French certification system is HQE (Haute Qualité Environmentale). It is promoted by the no profit Association pour la Haute Qualité Environnementale (ASSOHQE), located in Paris and founded in 1996. The HQE certification is voluntary. It is applicable to new and existing buildings for different uses. The certification system is managed by AFNOR Certification with the official name of „NF ouvrage – Démarche HQE”. AFNOR Certification appointed three certification bodies (Cerqual, Cequami, Certivea) to operate the certification system as third independent party. The first HQE certification (NF Office Buildings) was launched in 2005, the certification for residential buildings in 2007. The HQE certification is applied in all France. The BDM (Bâtiments Durables Méditerranéens) label is proposed by the BDM no profit association that was established in 2008, recognized as «Pôle Régional d‘Innovation et de Développement Economique Solidaire (PRIDES)» by the Région PACA. The main principle of the label, as for the Italian Protocollo ITACA, is the total contextualization of the assessment criteria to the local level. The BDM assessment system is under adaptation for other French regions also in the Alpine and Atlantic areas. The certificate is issued by the BDM association. The no profit association DGNB (German Green Building Council) is operating the DGNB certification. The origin of the system is from the private sector. Actually the DGNB certification is also recommended by the BMVBS (Federal Ministry of Transport, Building and Urban Development) for good planning and building practice. The DGNB system is available for occupancy profiles in high demand: office and administrative buildings, educational facilities, retail buildings, industrial buildings and residential buildings. The TQB (Total Quality Building) certification system is managed by the ÖGNB a non-profit organization (Austrian Sustainable Building Council). The first version of the assessment system (Total Quality) was developed in 2001 with subsidies from the Austrian Federal Government and based on the GBC’s (Green Building Challenge) GBTool. In 2010 the TQB system has been updated with regard to the international trends and to other Austrian building assessment systems. It is possible to certify residential buildings, offices, commercial buildings; schools, hotels, and shopping centers. TQB is the most applied environmental certification system in Austria. The Austrian Green Building Council (ÖGNI) in collaboration with the German DGNB has operated an adaptation of the DGNB assessment system to Austria. The first buildings are under certification. The most relevant Swiss certification system is Minergie – ECO, supported by the Swiss Confederation, the Swiss Cantons along with Trade and Industry. The certification is operated by the Minergie non profit organization. Minergie – ECO integrates the Minergie label with issues related to the environment and the comfort. It’s possible to certify residential buildings, office buildings and schools. The project ENERBUILD, consisting of a consortium of public organizations in the Alps, has set itself the goal to create a common tool particularly for public policy makers. 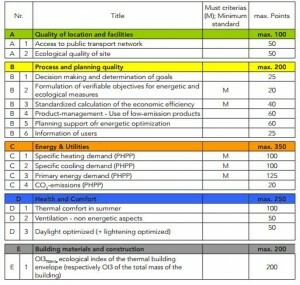 model for the development of environmental and energy-efficient building standards. In the project, it has been implemented the Enerbuild Tool, an interregional assessment tool to evaluate the environmental, social and economic performance of public buildings in the Alpine regions. In this project we will try to test the Enerbuild tool for pilot projects to test their parameters in respect to sustainability in construction. It will very important to have case studies on which to test the tool and see where it can be improved to really go further in the direction of a common assessment tool across Europe.